The 15 Royal Navy sailors and marines held captive in Iran for almost two weeks have landed in London.The crew, freed by Iran’s President Mahmoud Ahmadinejad as a “gift” to the British people on Wednesday, touched down at Heathrow Airport at 1200 BST. They are now being flown to a Royal Marines base in Devon where they will be reunited with their families. Prime Minister Tony Blair said he was “glad” the crew had been returned “safe and unharmed”. In a statement given outside Downing Street as the plane touched down, Mr Blair said there had been “no deal” with the Iranians to secure their release. He contrasted the rejoicing at the return of the crew with the “sober and ugly reality” of the deaths of four British soldiers in Iraq in what he described as a “terrorist act”. He repeated allegations that there were “elements of the Iranian regime” that were “financing, arming and supporting terrorism in Iraq”. The navy personnel arrived at Tehran Airport early on Thursday in a fleet of official cars after 13 days in Iranian custody. At about 0800 local time (0530 BST) they boarded a British Airways flight bound for London. They are now being flown by helicopter to Royal Marines Barracks Chivenor in Devon, where they will be de-briefed and given thorough health checks. BBC correspondents say military chiefs will be keen to assess the physical and psychological impact captivity has had on the crew before reuniting them with their families. Iranian television has broadcast pictures and statements from several members of the crew, including the only woman in the group, Leading Seaman Faye Turney. Commentators are divided over whether the release represents a diplomatic triumph for the UK, or a public relations coup for the Iranian president. The 15 service personnel had disembarked from HMS Cornwall in the Gulf when they were detained by Iran’s Revolutionary Guard on 23 March. The Iranians accused the crew of straying into its waters, although the British have insisted throughout that they were in Iraqi territory. The 15 Royal Navy crew members held captive by Iran are flying home after being freed by President Mahmoud Ahmadinejad as a “gift” to the UK.They are due to land at Heathrow at 1200 BST and will later be reunited with relatives at a military base. Before leaving Tehran, several of the crew spoke on Iranian television to express thanks for their release. Prime Minister Tony Blair said the homecoming would be “a profound relief” to the personnel and their families. The navy personnel arrived at Tehran Airport in a fleet of official cars, after 13 days in Iranian custody. 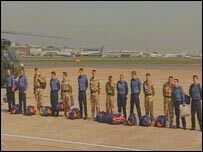 They left at about 0800 local time (0530 BST) on a British Airways flight bound for London. Military officials say they will be flown by helicopter to Royal Marines Barracks Chivenor in Devon, where they will be de-briefed and reunited with their families. Before leaving, one of the 15, Lt Felix Carman, told Iranian television: “To the Iranian people, I can understand why you were insulted by our apparent intrusion into your waters. Both said they had been well treated by their captors. Mr Ahmadinejad said no concessions had been made by the British government to secure the releases, but that Britain had pledged “that the incident would not be repeated”. Prime Minister Tony Blair said Britain’s approach to the crisis had been “firm but calm – not negotiating but not confronting either”. Speaking at a news conference, Mr Ahmadinejad repeated Iran’s view that the crew had “invaded” Iranian waters but said they were being freed as a “gift” to the British people. Britain says the crew were in Iraqi waters under a UN mandate when they were captured, and says the confessions were extracted under duress. Former British ambassador to Iran Sir Richard Dalton said Iran’s reputation had been harmed by the episode. “I think Iran’s reputation has deteriorated where it counts, in many capitals, including the capitals of countries which are close to it who have joined in the effort to get these captives released,” he said. However, former US ambassador to the United Nations John Bolton said President Ahmadinejad was the clear winner and had been strengthened in his pursuit of nuclear weapons. “President Ahmadinejad comes out of this as a winner on two counts,” he said. “He won by seizing British hostages and he won by unilaterally deciding to release them, having found out the answer to the question I think he was posing, which is – how strong a response will Britain make to this act of taking captive these 15 service members? And the father of one of the crew members criticised Tony Blair’s handling of the crisis. Jimmy Carter, who was US President in 1979 when American nationals were taken hostage at the US embassy in Tehran, said he was impressed that diplomacy had solved the crisis. “As soon as the harsh rhetoric was assuaged on both sides – from London and also from Tehran – then normal diplomacy prevailed. I’m very grateful to see that,” he said. Former Chancellor Lord Lamont, who is president of the British-Iranian Chamber of Commerce, said he believed the government made a “big mistake” by going to the UN. The BBC’s Frances Harrison in Tehran said speculation was likely to continue over whether the release had anything to do with developments in Iraq. There, an Iranian envoy has reportedly been given access to five Iranians captured by US forces and a kidnapped diplomat was released on Tuesday. Iranian President Mahmoud Ahmadinejad says 15 British naval personnel captured in the Gulf will be freed.He repeated allegations that the British sailors and marines “invaded” Iranian waters, but said they would be freed as a “gift” to Britain. He made the announcement at a news conference, in which he also awarded medals to the commanders who captured the British personnel in the Gulf. Britain says the 15 were in Iraqi waters under a UN mandate. 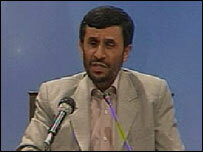 Mr Ahmadinejad also criticised the US-led invasion of Iraq and Israel’s war in Lebanon. He used a news conference marking the Persian New Year to condemn the countries he said were behind “misery” and “destruction” in the world. He said there did not appear to be anyone “to stand up and defend the rights of those oppressed”. He opened the news conference with references to the Islamic holy book, the Koran, then made a wide-ranging speech about the modern history of the Middle East, while attacking the West. The invasion of Iraq was based on the false premise that Iraq had weapons of mass destruction, he said, but even now “the occupation forces continue to stay there and people are still being killed”. US President George W Bush has warned that US troops will suffer if a dispute with Congress over a war funding bill is not resolved soon.Speaking at the White House, Mr Bush said Congress was failing in its “basic responsibility” to give troops the equipment and training they need. He renewed his threat to veto any bill that ties war funding with a timetable for the withdrawal of US troops. Both House and Senate have passed bills calling for troops to leave next year. Mr Bush said both bills would “undercut the troops” in Iraq and Afghanistan and repeated his warning that he would veto them. He also noted that 57 days had passed since he requested the war funding – and reproached members of Congress for having “left on spring break without finishing their work”. If Congress did not approve a war funding bill, “the price of that failure will be paid by our troops and their loved ones”, Mr Bush said, warning troops would spend longer on the front lines. 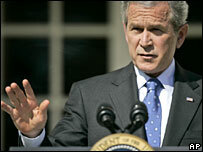 The president’s remarks came a day after Senate Majority Leader Harry Reid announced he would try to cut off money for most Iraq war operations after 31 March 2008, if the president vetoes Congress’s proposals. 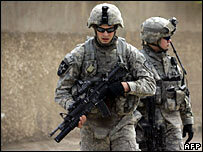 The end of March is the date set out in last week’s Senate bill for the goal of pulling all combat troops out of Iraq. In a statement on Tuesday, Senator Reid promised the Democrats would give US forces “the resources they need and a strategy in Iraq worthy of their sacrifices”. He said that if Mr Bush vetoed the bill, the president would be delaying funding for troops and keeping in place “his strategy for failure” . Mr Bush and Defence Secretary Robert Gates have warned that money for US forces in Iraq and Afghanistan could start to run out from mid-April if the funding bill is not passed. Analysts say the Pentagon has sufficient financial reserves to last until mid-July, if it moves money around. But Mr Gates has said the military will be “forced to consider” altering training schedules for reserves and units to be deployed to Iraq and Afghanistan, as well as delays in repairing equipment and renovating barracks. The Senate legislation approves $122bn (Ã‚Â£62bn) in funds – mostly for the wars in Afghanistan and Iraq – but also orders the president to begin withdrawing troops from Iraq within 120 days of passage of the bill. The House – whose $124bn bill imposes a 31 August 2008 deadline for troop withdrawal – and Senate must next reconcile their two versions of the bill and send the result to Mr Bush. If the president refuses to sign it and returns it unsigned, the bill will not become law. The votes in both the House and Senate were close enough to suggest Congress will not be able to override his threatened veto. Mr Bush’s Republican party lost control of both houses of Congress to the Democrats last year. Ã‚Â A suicide bomber blew up a truck near a primary school and police station in Iraq’s northern oil city of Kirkuk killing 12 people, including a baby. Another 178 people were wounded in the blast that caused extensive damage at a time when US troops were apparently visiting the police station, Kirkuk district police commander Major GeneralÃ‚Â Torhan Yussef Abdul Rahman said. Many of the wounded were pupils at the nearby school and local residents. The suicide bomber blew up the truck outside the criminal investigations department in the north Kirkuk district of Rahimawa. Ambulances in the city used loudspeakers to call on people to go to hospitals to donate blood following the attack. Separately, a roadside bomb targeting a police patrol in south Kirkuk wounded five policemen. Insurgent attacks are common in Kirkuk, which sits atop a third of the country’s oil resources and is home to a fractious ethnic and sectarian mix. The 15 Royal Navy personnel held captive by Iran could stand trial for “entering Iranian waters”, a senior Iranian diplomat has said.Gholamreza Ansari, Iran’s ambassador to Moscow, is quoted as telling Russian TV they may face “illegal action” charges. But the UK government says the captives were seized in Iraqi waters and has demanded their “immediate” return. The US has ruled out a deal to exchange the Navy personnel for five Iranians it captured in Iraq in January. According to Iran’s IRNA news agency, Mr Ansari told Russian television legal moves against the 15 had already started “and if charges against them are proven, they will be punished”. Britain denies Iran’s claims that the UK crew was in its waters when seized on 23 March. Earlier, US state department spokesman Sean McCormack rejected suggestions that a swap could be made for five Iranians, believed to be members of Iran’s Revolutionary Guard. They were captured in a raid in the city of Irbil, along with equipment which the Americans say shows clear Iranian links to networks supplying Iraqi insurgents with technology and weapons. US officials have condemned Iran’s actions and publicly supported the UK. Prime Minister Tony Blair has condemned Iran for “parading” the UK crew on television in a way which would only “enhance people’s sense of disgust”. But a former Iranian ambassador to the United Nations, Said Rajai Khorasani, told BBC Radio 4’s Today programme Mr Blair had been too “authoritative” in his approach. He was shown alongside two colleagues, one of whom was Leading Seaman Faye Turney, from Shropshire, who had been broadcast apologising to Iran earlier in the week. 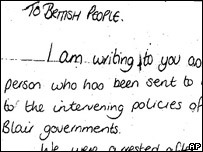 A letter, allegedly from LS Turney, was released on Friday in which she said she had been “sacrificed” to UK and US government policy. European Union foreign ministers, meeting in Bremen, Germany, called for “the immediate and unconditional release” of the sailors and expressed “unconditional support” for Britain’s position. UK Foreign Secretary Margaret Beckett described the latest footage as “quite appalling” and “blatant propaganda”. She also said she had replied to a letter from the Iranian government, but no detail of the contents was given. The Iranian letter had not suggested Tehran was looking for a solution to “this difficult situation”, Ms Beckett added. The BBC has been able to confirm the names of six of the 15 captured sailors and marines. Along with LS Turney and Nathan Summers, who is from Cornwall, they are Paul Barton from Southport, Danny Masterton from Ayrshire, Joe Tindall from south London and Adam Sperry from Leicester. Britain has asked the UN to support a statement expressing grave concern about the continuing detention of 15 Royal Navy sailors in Iran.UK ambassador to the UN Sir Emyr Jones Parry has circulated a draft text among member states at the organisation’s headquarters in New York. Iran says the sailors illegally entered its waters – which the UK denies. Iran said it has delayed the release of the only woman among the crew because of the UK’s “incorrect attitude”. The draft statement circulated among UN Security Council calls for the “immediate release” of the crew. The statement also notes that the Britons were operating in Iraqi waters under a mandate from the security council. Iran released video footage on Thursday which it said shows the British crew being seized in Iranian waters. It also showed a military briefing in which charts were shown indicating the crew were in Iranian waters. The BBC understands the language of the draft statement, being discussed behind closed doors, has been watered down because of reservations from some council members. The Foreign Office spokesman said it was hoped the UN would release the statement later on Thursday. The UN secretary-general has spoken to Iran’s foreign secretary about the issue, at an Arab summit in Saudi Arabia. European Union foreign policy chief Javier Solana said he had also spoken briefly to Iran’s foreign minister and reiterated the EU’s call for an end to the “illegal” detention. On Wednesday, Iranian state television broadcast an interview with LS Turney and a letter she had apparently written. Earlier Ali Larijani, Iran’s chief nuclear negotiator, said the release of Leading Seaman Faye Turney – which had been widely expected – had been delayed. He talked about the UK’s “incorrect attitude”, which appeared to refer to the UK’s refusal to agree the crew had been in Iranian waters. Tony Blair’s official spokesman said the UK was not seeking a confrontation. But he said footage shown on Iranian TV of LS Turney and the others was wrong in terms of “basic humanity”. He said although Iranian foreign minister Manouchehr Mottaki had promised that British officials in Tehran would be given consular access to the personnel, this had not taken place. Those who know the sailor have spoken of their shock at the news her release may be delayed. The Rev Sue Caddy, vicar at Oxon Church, near Shrewsbury, where LS Turney was married in 2002, said the congregation was praying for her. Iran has not disclosed where the service personnel are being held, but the BBC has been told they are at a military base in Tehran. Deputy Chief of the Defence Staff, Vice Admiral Charles Style, has produced data which he said proved the boarding party was 1.7 nautical miles inside Iraqi waters. The Iranian embassy in London said the Britons had been 0.5 km inside Iranian territorial waters. Pakistan’s cricket captain and the assistant coach are being interviewed by Jamaican police investigating the murder of Bob Woolmer.Team spokesman Pervez Mir said police had asked to talk to Inzamam-ul-Haq and Mushtaq Ahmed. “Those talks are going on now. We’ll have to wait for the outcome,” he said. It is not yet clear why the pair – senior members of the Pakistan squad – are being questioned but correspondents say it is a bizarre twist in the case. 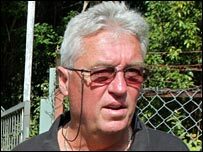 Pakistan’s players had already given police DNA samples and fingerprints as part of the probe into Mr Woolmer’s murder and were preparing to fly home. The UN Security Council has unanimously voted in favour of new sanctions against Iran for its refusal to suspend its nuclear enrichment programme. The 15-member panel’s decision to back Resolution 1747 broadens the limited sanctions imposed in December 2006. Iran insists its nuclear programme is purely peaceful in purpose. A news conference by the head of the UN and Iraq’s prime minister has been interrupted by a loud explosion sending debris falling from the ceiling. Speaking in Baghdad’s Green Zone, Ban Ki-moon was seen to flinch behind his podium and he appeared shaken by the nearby blast of a mortar or rocket. Within minutes the two men finished their news conference. They were clearly unhurt by the blast. Witnesses said a missile had landed about 50 metres from the building.